HiTi P510K provides the world smallest 6-inch roll-type dye sublimation photo kiosk in the market which is perfect for event photographers, photo studios, chain stores, hotels, or entertainment places. HiTi P510K is running with low operational cost that can quickly turn your investment into valuable margins. HiTi P510K delivers the truly user friendly GUI (Graphic User Interface) for easy-to-use operation. Apart from glossy photos, HiTi P510K is capable of matte finish. No media change required! P510K enables the users freely to add the customized photo e-frame from the backstage system to provide the value-added holiday or event prints anywhere. 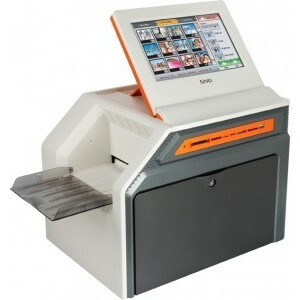 According to the customers , HiTi P510K provides various payment solutions for shop owners to manage how the customers pay for their prints and it can be connected to an optional ketboard. In addition, HiTi P510K can optionally be connected with to a EPSON TM-T88IV receipt printer.